We’re delighted to publish an Informed Scotland Leadership Special. It was commissioned by the Scottish College for Educational Leadership (SCEL) and launched at their major conference in Perth on 3 May 2017. Gillian Hamilton, Chief Executive of SCEL said, ‘Building leadership capacity at all levels through collaborative learning is crucial and must be a priority in education and beyond’. The SCEL conference, facilitated by Lyn Sharratt, Beate Planche and Maggie Ogram from Collaborative Networks for Learning, set out to ‘deepen understanding of the power of collaboration as a leadership and learning approach’ – at all levels, from the classroom teacher to the education system leader. It’s clear from our research for Informed Scotland, that improving leadership is a key focus for many organisations right across the learning and skills landscape – including in business, further and higher education, community and adult learning, third sector and government, as well as schools. In commissioning the Special, SCEL wanted us to capture the breadth of what’s happening and make connections with their own growing portfolio of programmes, resources and support for teachers and leaders at all levels. Practising what they preach, they’re keen to learn from others! 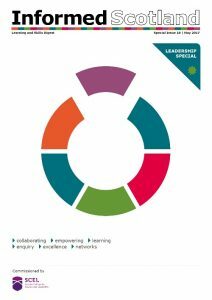 Like all Informed Scotland publications, the Leadership Special aims to encourage everyone to look beyond the usual places for inspiration. See #SCEL2017 for tweets about the conference. Previous Informed Scotland Specials can be downloaded here.